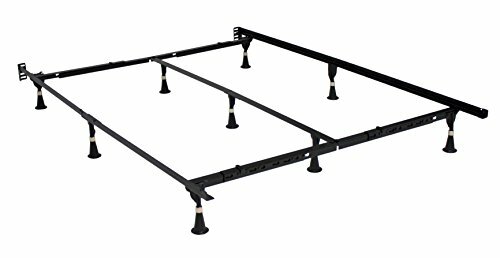 This Premium Bed Frame. Twin/Full/Queen/California King/Eastern King 9 Legs. Easy to Assemble. Extremely Compact. Made of heavy duty high carbon recycled railroad steel. Water-based, lead-free black finish. Solid rivet construction ensures durability and stability. Secured locking mechanism is permanently attached. Recessed triple-thick steel legs provide more toe room. Heavy-duty headboard brackets. 7.25"H with Glides. 2-year warranty.